Alfred A. Knopf, 9780375844423, 40pp. When Tillie Anderson came to America, all she had was a needle. So she got herself a job in a tailor shop and waited for a dream to find her. One day, a man sped by on a bicycle. She was told "bicycles aren't for ladies," but from then on, Tillie dreamed of riding—not graceful figure eights, but speedy, scorching, racy riding! And she knew that couldn't be done in a fancy lady's dress. . . . With arduous training and her (shocking!) new clothes, Tillie became the women's bicycle-riding champion of the world. 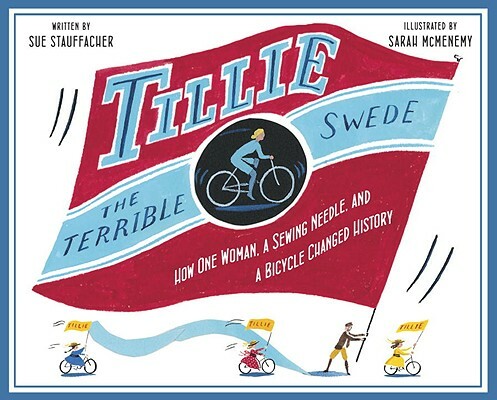 Sue Stauffacher's lively text and Sarah McMenemy's charming illustrations capture the energy of America's bicycle craze and tell the story of one woman who wouldn't let society's expectations stop her from achieving her dream. SUE STAUFFACHER'S books for young readers include "Harry Sue," "Donutheart," and Donuthead, as well as her new Animal Rescue Team series. Sue's picture book "Nothing but Trouble" won the NAACP Image Award for Outstanding Children's Literature. She is a frequent visitor to schools as a speaker and literacy consultant, drawing on two decades of experience as a journalist, educator, and program administrator. To learn more about her, please visit SueStauffacher.com. SARAH MCMENEMY is the illustrator of "The First Rule of Little Brothers" by Jill Davis, "Everybody Bonjours!" by Leslie Kimmelman, and "The Busiest Street in Town" by Mara Rockliff, all published by Knopf. She is also the author and illustrator of "Waggle" and "Jack's New Boat." Sarah lives with her family in London, England. Visit her online at SarahMcMenemy.com.